On 25 April 1915, with the landing of the Australian and New Zealand Army Corps (ANZAC) below the slopes of Sari Bair on the Gallipoli peninsula, the ANZAC legend was born. Unfortunately, due to sales rights restrictions, we cannot offer Shadows of ANZAC for sale in your country. On 25 April 1915, with the landing of the Australian and New Zealand Army Corps (ANZAC) below the slopes of Sari Bair on the Gallipoli peninsula, the ANZAC legend was born. Nine months later, having suffered thousands of casualties from disease, hand-to-hand fighting, bombing, sniping and forlorn charges across no man's land, the politicians and senior military commanders in London called it quits. While the Turks also suffered terribly, they at least emerged victorious. The fighting at Anzac was not restricted to the ANZACs and Turks alone. British troops also fought at Anzac from the earliest days of the invasion and large numbers of British and Indian troops were committed to the Anzac sector during the failed August offensive designed to break the stalemate. The invasion was also supported by large numbers of men - often non-combatants - who performed vital roles. Naval beach officers kept logistics operating in some form of 'orderly' fashion; Indian mule handlers moved supplies of food, water and ammunition to the front lines; and medical staff and army chaplains worked on the beach, caring for the wounded and the dead. All these men were frequently under fire from the Turkish battery known as 'Beachy Bill'. Others surveyed the narrow beachhead and bored deep holes for drinking water; signallers tried desperately to establish and maintain communications; and the gunners hunted the battlefield for suitable places to site their guns. Off the peninsula, but just as vital, were the nursing and medical staff on the hospital ships, at Lemnos, Alexandria, Cairo and Malta, and the airmen who flew above the battlefield spotting for the navy and artillery. Shadows of Anzac: An intimate history of Gallipoli tells the story of the 'ordinary' men and women who participated in the Gallipoli campaign from April to December 1915 and gave the Anzac legend meaning. 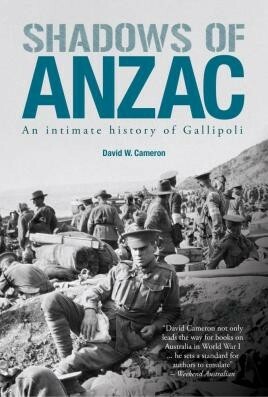 Drawing on letters, diaries and other primary and secondary sources, David Cameron provides an intimate and personal perspective of Anzac, a richly varied portrayal that describes the absurdity, monotony and often humour that sat alongside the horrors of the bitter fight to claim the peninsula.